PM: 6.25 miles sandwiched between the end of school and the track meet. Warmed up with an easy two treadmill miles then about an hour of strength training including some plyos. The box jumps are getting harder but something tells me I need to keep doing them. They might be the fountain of youth. Today is Andy's adoption day. We'll be going to watch the Utes play USC in baseball at Smith's Ballpark and dinner, as always, at Bucca di Beppo. AM: Sunday morning walk. 3.25 miles with Ann and Andy. PM: 7 miles around Sugar House Park. I surpassed the Amish Farmer Standard for the day. Zero. Got my hair cut. 6.25 miles. Push-ups, sit-ups, core. 2 mile jog around Copper Hills High School before the track meet. Not shaping up to be a very good week running wise. 5.25 easy miles around Sugar House before work. Late AM: 2 mile walk, push-ups and sit-ups. AM: Easy 4.5 mile neighborhood run. Kind of blustery. It's Friday! Two consecutive before work runs. PM: 6.5 treadmill miles at 7 minute pace. Some core and plyos after. 9 miles on the treadmill after track practice this morning. Some of it kind of fartleky - got up to as fast as 6 minute pace for a while. I was disappointed to see my employer, Alta High School, watering its extensive lawn in the downpour when I got to the track. AM: 10 miles. Laps around Sugar House Park. Nice to have some partial sunshine. PM: Mowed lawn, yard work. No running. Four mile walk instead. PM: No miles. Seriously, I wanted to but then I had a track meet and Andy's baseball game then it was past 8 pm so I just sat on the front porch and stared at Mt. Olympus with Ann while pondering my continuing midlife crisis. Loops around Liberty Park then 6 fast striders. Each strider was about .1 equaling .65 combined. Each one a little faster than the one before. Then I sat on the hill by the pond and watched ducks for a while. Got home in time to see Ann for a few minutes before she headed out for a 12 hour night shift. 9 miles on the treadmill. Alternated hard and easy running in 10 minute increments. Update...Blake ran a 4:27.55 to take 10th place in the 1600. Not a bad 2.5 second PR for him! Easy run today...7.75 miles in one hour. We'll have the annual coaches run at the meet tomorrow - usually good for 10 miles so I'll get a 50 mile week. Hardish 12 miles on the treadmill at the Provo 24 Hr. Fitness between the 3200 and the 800. Raining hard so I wimped out. Plus I needed the softer surface of the treadmill. Kept it at 6:20 pace for several miles and it felt pretty good. Also had some great conversations throughout the day. One long one with Timo Mostert, American Fork's coach, a true gentleman, and professional. My main career goal at this point is to put together a couple more Alta cross country teams that might at least force a team like AF to notice us. Also with Conner Mantz and the whole Mantz family who are just all great people despite the fact that Conner shunned my Furman Paladins for that school down South. I just love watching that kid race - win or lose, he always brings it! So basically I was just hoping all the excellence we have around here would rub off on me. Oh yeah...Bill Cobler, the coach at East. 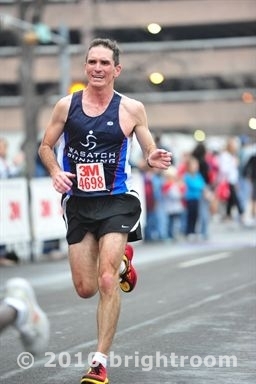 Nobody devotes more time, energy, and effort to his coaching and he never fails to produce tough, gritty competitors who approach running and racing the right way. I sometimes have a hard time giving Bill the credit he deserves because I've spent so much time hating him in races from 5ks to marathons over the years. And, yes, there is a right way (and a wrong way) to do this sport. PM: Another 2 mile walk. PPM: 2.25 more miles up to the Red Box with Ann to rent The Judge. Fighting a bad cold and losing, might not run today. So I ran a little today. I have a bad cold and feel like a complete turd but I ran 2.25 miles with Abby after work and then a couple more on my own. I excreted a gallon of snot during the run and actually feel a little better now! I'm thrilled to announce my return to the gully after a several month absence due to gas pipeline installation and Indian ruin excavation. Gully longer run in about 57 minutes. Not a bad run. Thought mostly about what I'm going to say at our track awards dinner tonight. Repeat performance in the gully today because I'm just so giddy about it being open. Averaged 7:54 for the Gully Longer Run. Good first day of running today for my xc runners. Pretty good group of upcoming freshmen plus a senior transfering from Rock Springs. PM: I ran 2.25 miles with Abigail Pumpkin Pie in 20 minutes-ish. We met Ann and Andy at the nifty new Imperial Park the city built in our neighborhood. Hung out there for a while - it seemed like Andy's whole 3rd grade class was there so he had spastic fun for a long time. Then we walked home and had Taco Thursday. Congrats to the Alta Hawks for winning the 5A state soccer championship today! 2 miles at practice with the team plus 10 stadiums. That's all I had time for. I'm hoping Andy's baseball game gets rained out so I have time for some more. PM: 3 miles plus some core stuff, push-ups and sit-ups around the fields at Andy's baseball game. I think some of the other parents think I'm odd. Why are adds for "sweet Asian women" popping up here on the FRB???? AM: Walked to downtown Sugar House with the kiddos. Had breakfast at Chic-fil-a (kids had breakfast, I had coffee), hung out at Barnes & Noble for a while, looked at all the newborn ducklets in the creek, and then walked home. PM: 8.25 kind of cold, rainy miles. The street lights were on in my neighborhood at 3:30 in the afternoon it was so dark out. Not much of a week mileage wise but a great week in other ways. I'm feeling pretty strong with minimal aches and pains. Still looking for that perfect late summer/early fall race while I have time to train and before cross country season gets rolling seriously. 10.25 miles around Sugar House, Foothill, and Millcreek. Perfect morning. 7:35 average pace. PM: 3 mile walk with Ann. Grilling and relaxing with neighbors and neighbor kids after. Maybe, just maybe, I'm heading up to Jeremy Ranch in the morning. I ran the first 12 by myself. Started from home, did a couple laps around Sugar House Park and then wound my way north and west to Liberty Park then a few laps around Liberty on the wood chip. Finished 12 miles at an average pace of 7:35 then ran 3 more miles with Abby in 8:55, 8:50, 8:35. Happy Freedom Isn't Free Day to everyone. PM: 4 miles in 35:58 with Abby. A true recovery day. Later PM: Walked a total of 3 miles while Andy was playing at the super-nifty new Imperial Park here in Salt Lake City. An earnest and sincere young missionary from the LDS Church (it's a big deal here) invited ust to "Pie Night in the Park" this Saturday at 6:30 to which we'll definitely go because we like pie. This afternoon I did my once patented (meaning I used to do it all the time) treadmill fartlek, It's basically 2 minutes at 7mph, 2 minutes at 8 mph, 2 minutes at 9 mph, and 4 minutes at 10 mph. Repeat six times. So, a total of 24 minutes at 6 minute pace or faster. 1.5 on the treadmill incline. I'm detecting less life on this blog than in years past. I wonder what happened? 6.25 miles around Alta High and its environs after school. Threw in some barefoot striders at the end. Five easy miles at Liberty Park plus some core and drills. Andy's baseball team almost won a game tonight. Jeremy Ranch, for the uninitiated, is a rolling dirt road that parallels a creek through some beautiful country up near Park City. It's a little more than 7 miles one way, so 14.25 total miles. It's rolling, but more downhill out and more uphill back. Strangely, it often seems to have a headwind both ways. The elevation is about 6,300 feet. Today was pretty warm and I ditched my shirt about a mile in. I was sort of planning to take it really easy and just enjoy the run on a perfect morning. So I was thinking about 8 minute pace. But I was feeling pretty good and ended up averaging 7:37 pace. 14.25 miles in 1:48:25. 7:50, 7:42, 7:35, 7:30, 7:43, 7:32, 7:26, 7:31, 7:50, 7:42, 7:46, 7:38, 7:23, 1:23. The only thing that would have made this run better was some company. I did see some deer, a coyote, and a Bald Eagle ( being our national symbol, I feel it should be capitalized).